​Here's our handy guide to using the cycleway so that it works well for everybody, whether you are riding a bike or not. 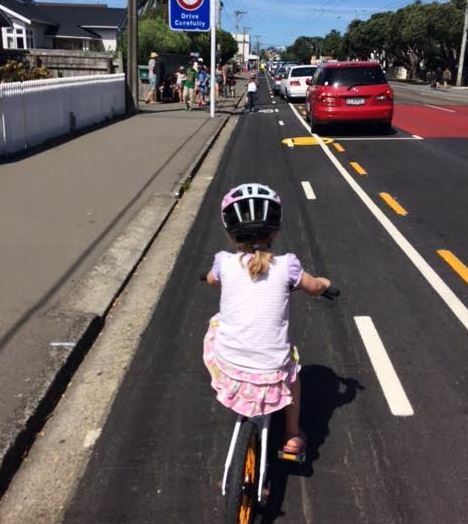 Wellington City Council have already published their own guide to using the cycleway which you can see on the right (click on the image to expand). The advice below is intended to supplement the council's guidance and goes into more detail from the perspective of different road users. The advice has been developed by Island Bay residents who are riding, driving and walking The Parade on a daily basis. This is just advice. It is a living document that will evolve over time as we all get used to interacting with the cycleway. ​If you have suggestions about changing or adding to this advice please contact us. A little bit of courtesy and common sense is all that's needed to avoid most problems. Be nice to each other. People on bikes generally have priority on the cycleway but the bus stop bypasses are a shared space where bikes give way to pedestrians crossing the bypass. Moderate your speed on the cycleway. Relax and enjoy the fact that you are not on the road competing for space with cars. 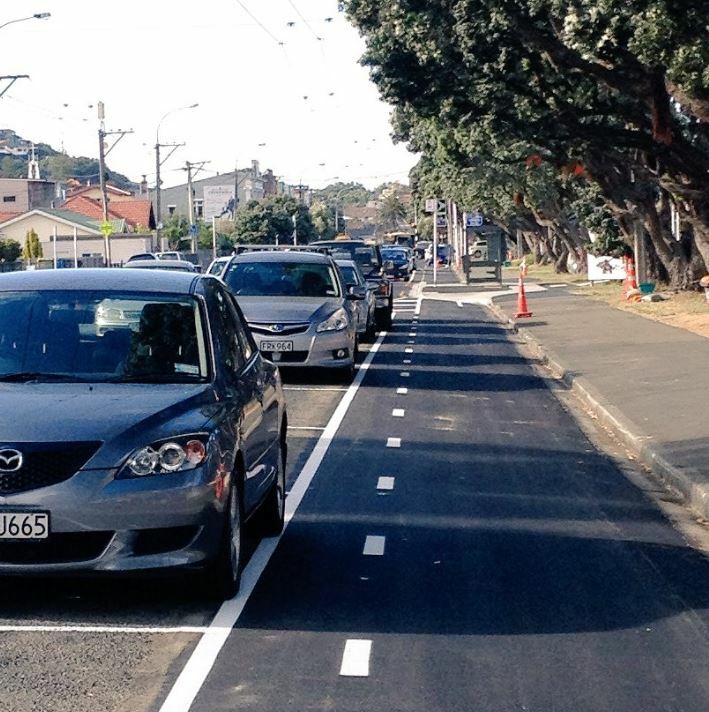 The new bike lanes are one way only – ride in the same direction as the traffic. You have right of way on the cycleway but the bus stop bypasses are a shared space. Give way to pedestrians crossing the bypass if you need to. If there is a bus at the bus stop as you are approaching slow down and watch out for passengers getting off the bus! You don't have to use the bus stop bypasses if the bus stop is clear and it is easier to ride straight through. If a pedestrian crossing is marked on the cycleway you must stop for pedestrians using the crossing. You have the right of way where there is a pedestrian crossing bypass but be prepared to slow down and stop for pedestrians who may not have seen you. Right of way does not give you the right to knock people over. Pedestrians and people getting in and out of cars have a right to be temporarily in the cycleway. Make sure you have time to slow down or stop if necessary. Cars going in and out of driveways have a right to be temporarily blocking the cycleway. Make sure you have time to slow down or stop if necessary. If you have to slow down or stop be nice about it. Don't forget there are plenty of obstructions out there on the road too and you don't need to deal with most of them any more. Don't overtake other people riding bikes in the cycleway unless there is room to safely do so. You can usually overtake on the right wherever there are driveways or empty carparks. If you are travelling faster than the traffic for any reason, take care approaching driveways and side streets in case turning traffic hasn't seen you. Use the centre of the lane in the 30 kph shared zone through the shopping centre. You have a right to be there and it makes things much safer for everyone when people on bikes are clearly visible rather than squeezed over to the left. This will also keep you well away from the angle parking. Unfortunately, if you are with children who are not confident riding in traffic you will probably need to go through the shopping centre the old-fashioned way. Either get them to bike on the pavement, which is legal if they are riding a bike with a wheel diameter up to 355mm, or dismount and walk their bikes through. Nice parking! Please don't park in the buffer zone. People on foot have right of way on the pavement and people on bikes have right of way on the cycleway. Let pedestrians and cyclists go first when pulling in and out of driveways. If you need to temporarily pause in the cycleway when pulling in and out of driveways you have a right to do so but please don't block the cycleway unnecessarily or for longer than than you need to. As you approach a left hand turn into a driveway or side street make sure you are scanning the cycleway for people on bikes. That way you can be confident about whether there are any bikes coming when you make your turn. You should avoid over-taking a person riding a bike along the cycleway if you are getting close to your intended left-hand turn. For example, if someone on a bike is within 50 m of your turn and travelling at a modest 20 kph they will be there in less than 10 secs. When you make a left hand turn into a driveway or side street check your side mirror and glance over your shoulder before making the turn slowly. Even though you might not have perfect visibility down the cycleway if you are going slowly enough a person on a bike will still be able to see you and slow down and stop if necessary. If you are getting out of the passenger side of a car make sure you check your side mirror and glance over your shoulder before opening the door. You have a right to be temporarily in the cycleway if you are loading or unloading your car but please don't block the cycleway unnecessarily or for longer than than you need to. Please park in the marked spaces. The broken white line shows the door buffer zone which should be left clear. Don't park anywhere that is not a marked space, including the hatched areas (white diagonal lines). These are very important for creating visibility of the cycleway, especially at intersections. This is a 30 kph shared space where bikes and motorised traffic have equal priority. As you enter the shared zone please give way to bikes that are merging into traffic from the cycleway on the left. A person on a bike is allowed to cycle in the middle of the lane for safety, rather than being forced across to the left near parked cars. Don't try to overtake people on bikes within the 30 kph shared zone. People on bikes have priority on the cycleway so check for bikes before crossing. If you need to temporarily pause in the cycleway for some reason you have a right to do so but please don't block the cycleway unnecessarily or for longer than than you need to. The bus stop bypasses are a shared space and you have right of way when crossing them. However, please don't block the bus stop bypasses unnecessarily or for longer than than you need to. If a pedestrian crossing is marked on the cycleway then you have right of way when using the crossing. You do not have right of way on a pedestrian crossing bypass, which is part of the cycleway. Check for people on bikes before crossing a pedestrian crossing bypass.